Project Description: Using Prown’s methodology, what information can be extracted from one of the objects you have been working from in Studio? This can be the object/photo you brought to Studio in Week 1 (that defines “beauty” for you), or a different object from your “Beauty Container” – whatever seems appropriate to you, and lends itself more readily as “material evidence” to Prown’s method of analysis. Azealia Banks is five foot three, 123 pounds, but her doll comes in at fourteen inches tall and a quarter of a pound. Made from polyester, yarn, and cotton. 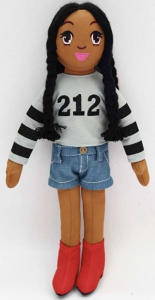 The doll sports a grey long sleeve tee with “212” written across it and three black stripes on the arms. Denim short shorts with white stitching follow, and red heeled, mid-calf boots to finish her look. All of which resemble the same outfit Banks sported in her 212 music video. Her hair in braids down to her waist, and her lipstick pink. Looking at this object, I feel proud. Seeing this artist battle her demons and struggle for many years, I see this doll as a symbol of her rebirth as an artist. This doll was given to me by the artist herself at her last concert in New York. Kicking off her first tour in years, It was a sold out show. It was an emotional night for both her and the audience; Seeing her as a better version of herself while still holding a strong fan base throughout her journey made everyone in the room feel a sense of love. This doll from that night is very nostalgic for me to look at, and makes me feel hopeful. As Prown’s has mentioned, “These are biases that we take for granted; we accept them as mindlessly as we accept the tug of gravity. Is it possible to step outside of one’s own cultural givens and interpret evidence objectively in terms of the beliefs of the individuals and the society that produced that evidence?” Although a rapper, I find that the hip-hop culture disregards Azealia banks. Her music does not fit in to the specific genre that is defined as hip-hop today. Instead, you find mixtures of hip-hop, r&b, pop, and rock in her music. A doll as a form of merchandise for fans is also something that you would not find in typical hip-hop culture. Azealia has been able to step outside the given culture of hip-hop, but the general public and rest of the culture has had a harder time stepping out with her. This doll tells the story of the rise and fall of Azealia Banks. However, it also provides hope and shows the current rise again of Azealia. It tells a story of hardship and demonstrates a strong passion, This doll was released during the lowest point in Azealia’s career. This is known not only from the time period in which it was released, but the overall look of the doll. Rather than a plastic doll such as a Barbie, it is more of a Raggedy Anne doll with no strong resemblance to the artists rather than the outfit and hair. Azealia still released the doll and was still able to get them to sell out. She was passionate about holding onto her career as an artist in the music industry. Similar to Prown’s belief, an object can tell a lot about it’s history. Although struggling against the world, a place Azealia always had a home and strong fan base in New York. Born and raised in Harlem, Azealia has spent the majority of her life here. I believe that New York is filled with certain types of creatives that understand her other people from different places cannot understand. Like Prown, I believe that cultural geography can greatly influence material culture as well as people’s’ interest, likes, and taste. Prown, Jules D. “Mind in Matter: An Introduction to Material Culture Theory and Method.” Winterthur Portfolio Vol. 17, No. 1 (Spring 1982): 5.